Mindful eating nourishes your brain in a vital way. While you are eating healthy food to supply your brain with the nutrients it needs to be well, when you eat mindfully you also give your brain a much-needed break. Perhaps you are like the tens of millions of people who have an anxiety disorder, and your mind is always racing, worrying, ruminating, and overthinking. Maybe you’re like the countless billions of human beings who live with constant stress and pressure. You’re always “on,” multitasking without breaks. Have you ever gulped down food at your desk, more concerned about spilling on and damaging your computer than you are about damaging yourself? Are you one of the 20-25 percent of adults who will experience some type of mental illness (including anxiety, mentioned above) this year? Are you happy, content with your life, and want to stay that way? It can be hard, though, to figure out when and how to take a break. Sometimes, the idea of a break causes stress — all that lost time! Other times, we can stop what we’re doing for a while, but the mind doesn’t stop. The anxious thoughts and worries, the depression, the obsessions, traumatic memories, or anything else you’re dealing with just won’t go away. It’s a catch 22: Your mind won’t stop thinking. One of the most effective ways to calm and nourish your brain is to take a break. If (and it can be a big “if”) you can take a break, your brain thinks even more. We all have several natural opportunities every single day to take a break, and during that break there’s a way to quiet and soothe the mind. 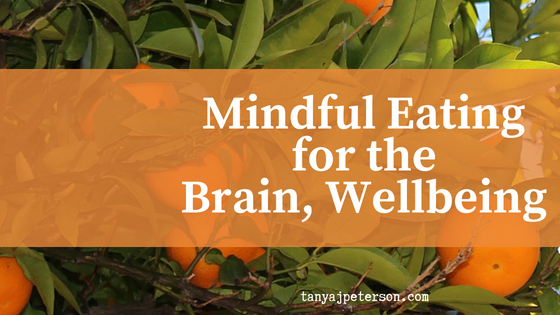 We need to eat, and mindful eating gives the brain nutrients and teaches it to be still. When you take time to eat a healthy snack or meal, you are feeding your brain. Foods can have a positive impact on anxiety and mental health in general. Combine healthy eating with mindful eating, and you are actively doing something powerful for your brain and wellbeing. 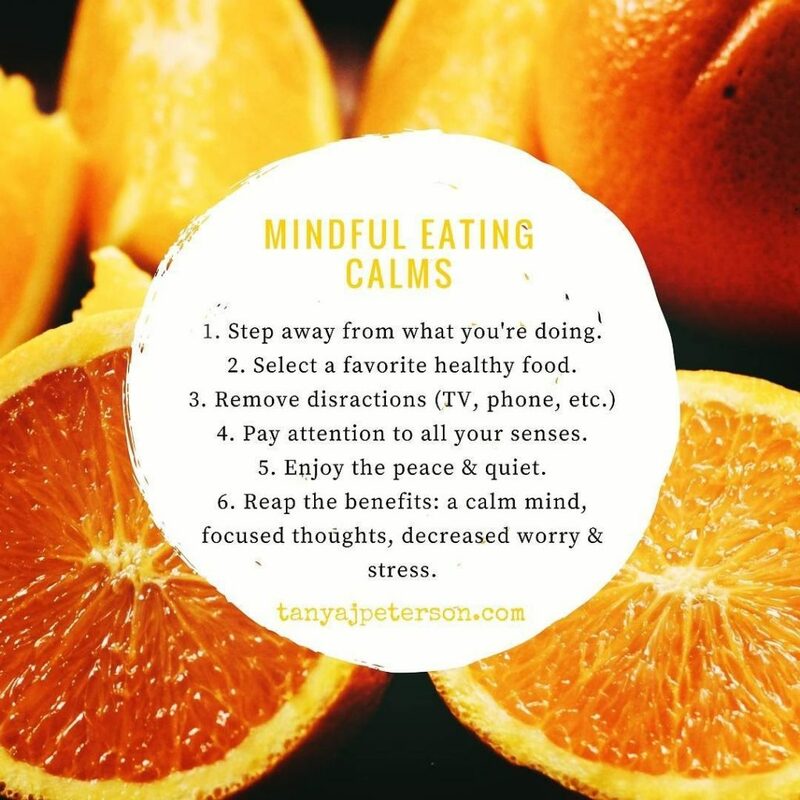 Mindful eating involves a true break from stressors and stimuli. You pay attention to the full eating experience. Attend to your senses and notice your food’s taste, texture, appearance, smell, sound (crunchy? quiet?). When your mind wanders, return to the food in front of you. You don’t have to sit down to a seven-course meal to do this. In fact, it doesn’t have to be a meal at all. Have a quick, healthy snack and eat it mindfully for a few short minutes. Taking short, frequent mindful eating breaks is effective in creating calm and reducing stress and anxiety. Mindful eating is simple, but it’s not necessarily easy. The brain must be taught and nurtured. It does take some time for the brain to be calm and still, but it’s possible. 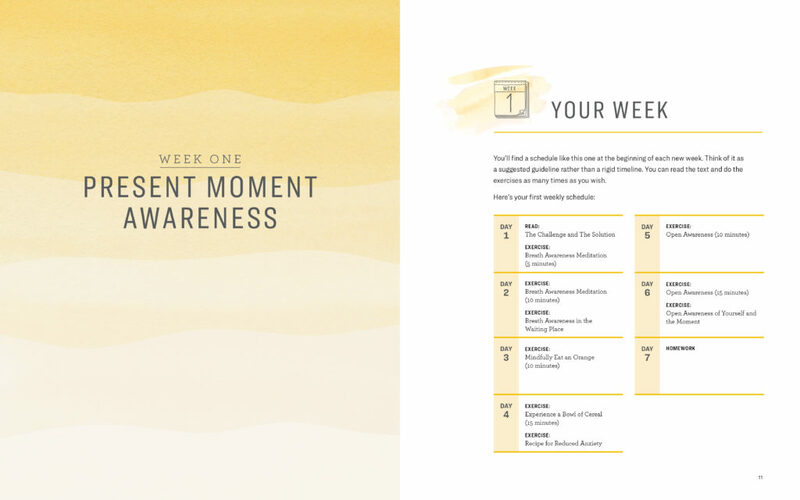 Subscribe to the Wellbeing & Words monthly newsletter by scrolling to the bottom of the page!